cut the pieces. Start building the drawers by cutting the V^'-thick drawer fronts/backs @ and drawer sides @ to a width Vie" less than the height of the opening. In my case, I cut these pieces 213/i6M wide (Fig. 10). As for length, cut the sides (I) 73/8" long. To determine the length of the fronts/backs (H), measure the inside opening on the shelf (34y2,T) and sub tract Vie" (to allow space between the drawers). Then, to determine the length of one front/back pdeae, divide bv three (llVig"). finger hole. After cutting the dovetail joints, lay out and cut a finger hole centered on the length of each drawer front (Fig. 11). 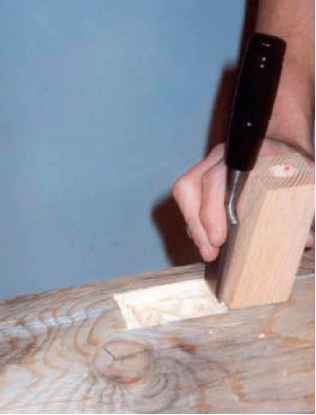 Then, to make it smooth for fingers, Me down the inside edge of the hole (i% lla).